Two recent ‘secret’ commissions that I can now share, as they are now in their new home. Yellow Chick – Faber Castell Polychromos on Winsor & Newton Bristol Board 12cm x 15cm. Thank you to C Allsebrook for the use of the original photograph. 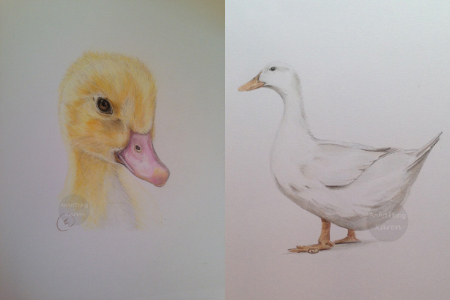 White Duck – Faber Castell Polychromos on Winsor & Newton Bristol Board 14cm x 14cm.. Thank you to ‘Stalksthedawn’ for the use of the original photograph.